Top marginal income tax rates used to be much higher back in the 1950s and 1960s. How much revenue did those higher tax rates actually collect? Daniel Baneman and Jim Nunns address that question in a short report,"Income Tax Paid at Each Tax Rate, 1958-2009," published by the Tax Policy Center last October. For starters, take a look at the statutory tax brackets for 1958 and 2009. The The tax brackets are adjusted for inflation, so the horizontal axis is constant 2009 dollars. 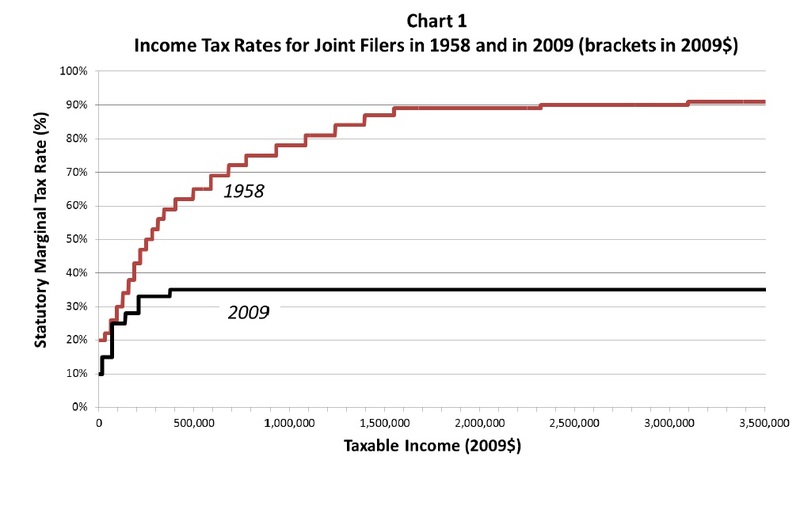 The top statutory tax rate in 2009 was 35%; back in 1958, it was about 90%. Marginal income tax rates are lower across the income distribution in 2009. 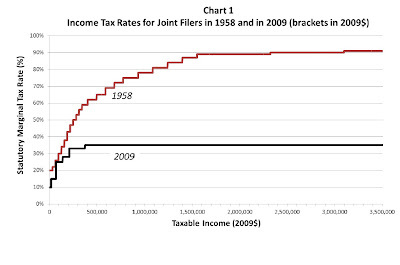 In addition, the top marginal tax rate occurs much lower in the income distribution in 2009 than it did in 1958. How many households actually paid these rates? 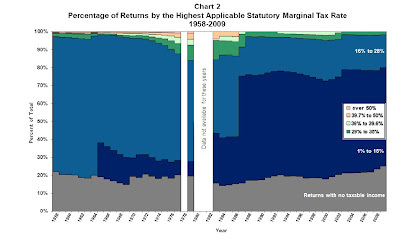 Here's a figure showing the share of taxpayers facing different marginal tax rates. At the bottom, across this time period, roughly 20% of all tax returns owed no tax, and so faced a marginal tax rate of zero percent. 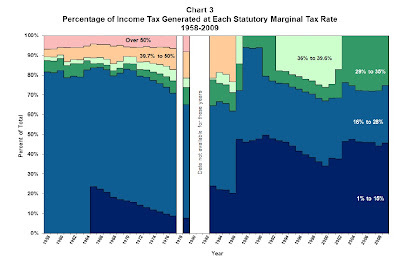 Back in 1958, the most common marginal tax brackets faced by taxpayers were in the 16-28% category; since the mid-1980s, the most common marginal tax rate faced by taxpayers has been the 1-16% category. Clearly, a very small proportion of taxpayers actually faced the very highest marginal tax rates back 1958. It's interesting to note how the share of taxpayers facing higher marginal rates expanded substantially in the 1970s, probably due in large part to "bracket creep"--that is, tax brackets at that time didn't increase with the rate of inflation, so as wages were driven up by inflation, you were pushed into higher tax brackets even though real income had not increased. How much revenue was raised by these high marginal tax rates? 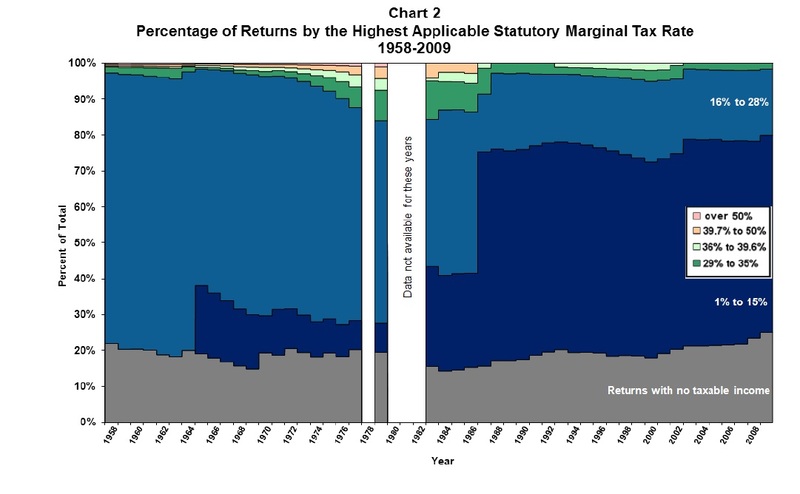 Although the highest marginal tax rates applied to a tiny share of taxpayers, marginal tax rates above 39.7% collected more than 10% of income tax revenue back in the late 1950s. It's interesting to note that the share of income tax revenue collected by those in the top brackets for 2009--that is, the 29-35% category, is larger than the rate collected by all marginal tax brackets above 29% back in the 1960s. 1) Perhaps it goes without saying, but there's no reason to think that 1958 was the high point of social wisdom when it comes to tax policy. In addition, the economy has evolved considerably since 1958: talent and tasks are probably more mobile, and methods of categorizing income in ways that affect tax burdens have become more sophisticated. Also, the distribution of income has become much more unequal in recent decades, and so arguments over the appropriate share of taxes to be paid by those in the top income groups have evolved as well. 2) Raising tax rates on those with the highest incomes would raise significant funds, but nowhere near enough to solve America's fiscal woes. Baneman and Nunns offer this rough illustrative estimate: "If taxable income in the top bracket in 2007 had been taxed at an average rate of 49 percent, income tax liabilities (before credits) would have been $78 billion (6.7 percent of total pre-credit liabilities) higher, taking into account likely taxpayer behavioral responses to the rate increase." The behavioral response they assume is that every 10% rise in tax rates causes taxable income to fall by 2.5%. 3) If one wants to use the 1958 example as a precedent, it would be fair to point out that the lowest-bracket income tax rates are a fairly new development, as of the mid-1980s. One could also use the example of 1959 to argue that many more taxpayers in the broad range of lower- and middle-incomes should face marginal federal tax rates in the range of 16-28%. 4) If the goal is to raise more tax revenue from those with high incomes, higher tax rates are not the only method of doing so. For example, one could limit various tax deductions that apply with greatest force to those high up in the income brackets. One could also look at ways in which the tax code lets those with high incomes pay lower rates, like the lower tax rates for capital gains and on tax-free investments like state and local bonds.